Halfway through the Next Chapter Project, we are delighted to see participants of NICVA hubs, in Belfast/Lisburn/Castlereagh (BLC), Mid Ulster, and Enniskillen, progressing through the Capacity Building Programme, joining formal politics, running for council elections, becoming directors of voluntary boards, working on community projects to make a difference for women in their communities and taking part in policy consultations and decision making. We celebrate that seven participants from the Mid Ulster and the Belfast, Lisburn and Castlereagh hubs have joined the board of directors of voluntary organisations at their local community. We are also delighted to see that eight other NICVA chapter participants have gone a little bit further into the journey of formal politics and are running for council elections in Fermanagh, Donegal, Belfast, Ards and North Down and Magherafelt. The Next Chapter provides opportunities for women to increase their understanding of the political peace process and decision making while also learning skills for participating in public life through The Next chapter Capacity Building Programme. The training includes skills for public speaking, crisis management and effective communication. We are very encouraged by the number of NICVA chapter participants who are involved in the training and coaching. Around 55 participants have completed Module one and Module two and 50 members of the chapters are currently benefiting from coaching sessions. The chapter meetings continue to be a successful avenue for decision making exercises. Participants of the BLC hub and the Enniskillen hub took part of the Equality Commission Consultation on the policy paper “Equality in Participation in Public Life in Northern Ireland”. In Mid Ulster participants had the opportunity to contribute to the Equality Commission consultation in preparation for their shadow report to the United Nations on “Women in Northern Ireland UN Convention on the Elimination of All Forms of Discrimination against Women”. The Report highlights the priority equality issues affecting women in Northern Ireland. Chapter meetings also provide space where participants plan and develop community projects that will benefit women in their areas. Innovative ideas for engaging other women into the community and leadership activities are discussed and agreed by consensus. The wellbeing project for women of the Mid Ulster chapter hub and the women’s community infrastructure project of the Enniskillen hub participants are just two examples of how chapter participants are contributing to reduce women’s rural isolation and to increase women’s engagement in community and public life. “I think the meetings are great and I am getting more confident in myself and my abilities from this, particularly in relation to the development of our community project. I look forward to moving forward with its development. Being able to listen to the story of one local political representative and having the opportunity to participate in a consultation are also opportunities I never thought I would have. I thoroughly enjoy and am elated that we have a chapter in Enniskillen, as for years I always wanted to join a group such as this, but there often has been nothing in Fermanagh that suited my interests; but through this am continuing to develop my skills and become more confident in myself” (Sinead, Enniskillen Chapter) . 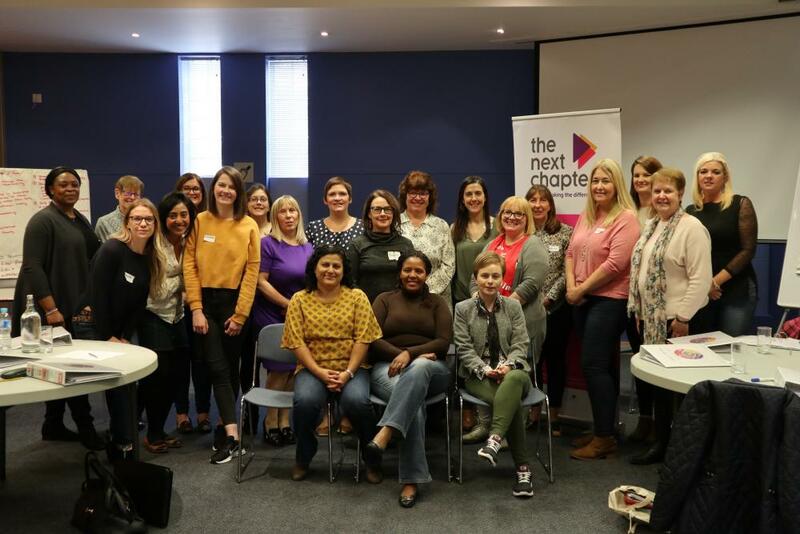 As the NICVA Regional Coordinator of The Next Chapter, I am very proud to be part of this programme and delighted to work with more than 100 women who are part of the NICVA hubs in Belfast, Lisburn and Castlereagh, Mid Ulster and Enniskillen. I continue to be inspired by the participants achievements, their commitment to gender equality and their contributions to improve the life of women in their communities. The Next Chapter project is delivered in partnership by Politics Plus, Irish Rural Link and Northern Ireland Council for Voluntary Action (NICVA), and is supported by the European Union’s PEACE IV Programme, managed by the Special EU Programmes Body (SEUPB). The Next Chapter contributes to SEUPB’s overarching programme output of regional level projects that result in meaningful, purposeful and sustained contact between persons from different communities. To find out more about the programme, visit the website: www.thenextchapter.eu. NICVA partners with Politics Plus and Irish Rural Link to deliver The Next Chapter Project, whcih aims to help women make a difference.